Firemaking is used to create fire from logs and ignite various light sources as well as other objects. 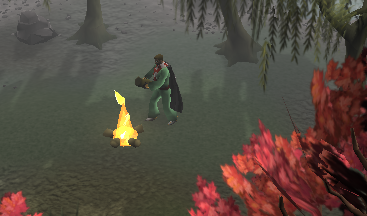 It is closely related to the Woodcutting skill, since the main method of training Firemaking is to burn logs. Logs are naturally one of the essential items necessary for building fires. To obtain logs, cut down a tree using the Woodcutting skill. Logs are also commonly sold by players on the Grand Exchange. 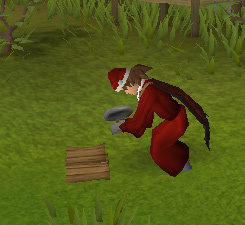 A Tinderbox is also a necessary item for setting logs on fire. Tinderboxes may be bought at any General Store ( ) for 1gp each. Ignatius Vulcan, found wandering around east of the Ranging Guild, also sells Tinderboxes for 1gp. For players familiar with Barbarian Firemaking, a Tinderbox can be replaced with a Bow. Use a Tinderbox with Logs in your inventory. Drop the Logs, and use the Tinderbox on them. Drop the Logs and select the "Light Logs" left-click menu option on them. Use a Bow with Logs in your inventory. This method requires completion of Barbarian Firemaking. Use the Logs with a Summoning Familiar listed above. Your character will now continue trying to light the logs until the fire catches, and then they will move one step away from the fire. Now you've got a toasty-hot fire! The fire will continue to burn for several minutes, after which time it will be extinguished. Ashes are always left behind when a fire burns out. Once you have become better at Firemaking, you will be able to burn a wider variety of logs which give even more experience. These logs from less common trees require a higher level and some can only be found in certain places in the RuneScape world, but they are also worth more than normal logs. It's worth noting that higher-level logs do not necessarily make a fire last longer. Members have the ability to burn Pyre Logs once they've completed the Shades of Mort'ton Quest. Burning Pyre logs will give added firemaking experience. If you've already given Razmire, the Mort'ton General Store owner, Serum 208, you can speak to him and buy some Olive Oil from his shop. Now you need building supplies. Limestone Bricks, Planks, Swamp Paste can all be bought at the Builder's Store. A Flamtaer Hammer is very helpful, which you can buy for 13,000gp at the General Store. If you don't want to spend all that cash, just bring a regular Hammer. Begin rebuilding the Temple Wall in the northeast corner of Mort'ton. Once your sanctity reaches 10%, the fire in the center can be lit with a Tinderbox. Once it's lit, use the Olive Oil with it to get Sacred Oil. Pour some on the logs of your choice to get that type of Pyre Log. By collecting the remains of the Shades in the dungeon nearby, you can burn the logs on the Pyres around the village to maybe get a Key for opening chests. Some have items in them, and you may even find a piece of Fine Cloth, which is used in making Splitbark Armor. Additionally, players can add logs to existing fires, called bonfires. You can add logs to a bonfire by either clicking on the logs and then clicking on the desired fire or by clicking the logs themselves and selecting "add to bonfire." There must be a nearby fire to do this. Per log, bonfires give a small experience gain per log. The experience values are as follows. Along with this you won't have to do all of that incessant clicking by training with bonfires and don't always have to spend all of that time looking at the game or computer screen. The experience you get from bonfire firemaking increases if you are firemaking with several other people. The percent increase will go up 1% for every person firemaking until five people are adding logs to the bonfire, making for a maximum of a 4% gain. Even if you keep adding logs to bonfires they will not last forever and eventually burn out, although placing logs in bonfires does make the fires last considerably longer. Along with the experience advantage, bonfires have some non-firemaking uses. Throwing some logs into a bonfire can increase your maximum lifepoints by 5% for a certain amount of time. The lifepoint boost and duration of the boost depends on your constitution level. Also, bonfires may release fire spirits. Fire spirits will reward you for releasing them. If you are burning lower level logs they will only give you meager rewards, such as a couple runes, charms or low level ores. However they will give better rewards as the level of the log you are burning increases. For example, burning Magic logs can yield adamantite or even runite ore.
Members also have the ability to light Lanterns, which are used while in extremely dark places. For info about making the actual lantern, check out the Crafting guide. To light a Lantern, you first need to get fuel for it. Collect some Swamp Tar from either the Lumbridge or Mort Myre Swamp, and bring it to the Chemist west of Rimmington. Use the tar with the Still on the Chemist's table, and then use the lantern with the Still to fill it up. Candle Lanterns just need a lit Candle to be used with them. Now just use a Tinderbox to light it. The better the Lantern you use, the brighter the light is. The Harpie Bug Lantern is not used as a light source, but instead to defend against Harpie Bug Swarms. The Sapphire Lantern is used during the Tears of Guthix Quest, but can also be used as a decent light source and to attract light creatures. The Emerald Lantern is used in the Lunar Diplomacy Quest to uncover jinxes on the ship. It can later be used for a good light source. Speak to the Cabin Boy on Lunar Isle if you ever need another lense. Upon completion of the Lost Tribe Quest, Members have the ability to light Goblin Mining Helmets. One can be aquired by trading the Brooch (quest item) with Mistag for a helmet. They are also dropped by Cave Goblin Miners. Like Bullseye lanterns, the mining helmet won't explode in the Lumbridge Swamp caves but has the added benefit of being equipable in the helmet slot. It is lit by using a tinderbox on it, just like every other lantern. 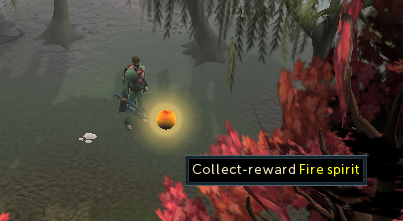 Of course, you are able to light several other items in RuneScape. Some are just used in quests, while others are used for extra lighting in dark places. Candles, Black Candles and Torches all require level 1 firemaking to light with a Tinderbox. 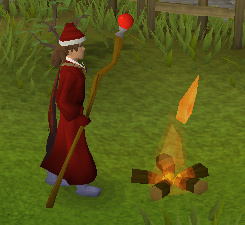 Barbarian firemaking is a method of firemaking available only to members with level 35 or higher firemaking. Instead of requiring the use of a tinderbox to light fires, you use a shortbow or longbow of any type (this does not work with Ogre, composite, crystal or dark bows) to light your logs 'the old fashioned way'. To start using this method, you will first need to speak to Otto Godblessed who can be found southwest of the Barbarian Outpost. When you ask Otto about Barbarian firemaking he will talk for a while and then will ask you to light some Oak logs with this method. After doing this, speak with Otto about firemaking with a bow again. You can light any logs with a bow rather than a tinderbox. The level requirements and experience rewards are in the table below. Are you the type that's always on the run? Do you feel the need to eat a snack wherever you're going? If so, the Rotisserie Cooking Spit is just for you! With this nifty invention (which can be Smithed), you can set up your own rotating roaster (over a fire) and cook either Chompy Bird Meat or Rabbit Meat. Simply use the meat with the spit, light a fire, and then used the skewered meat with the fire. Voila - one meal to go!